COLORADO SPRINGS, CO—After learning that the gun had been involved in a violent attack that left three dead, National Rifle Association representatives reportedly visited the Colorado Springs Police Department evidence room Monday to check up on the semi-automatic rifle used in Friday’s Planned Parenthood shooting. 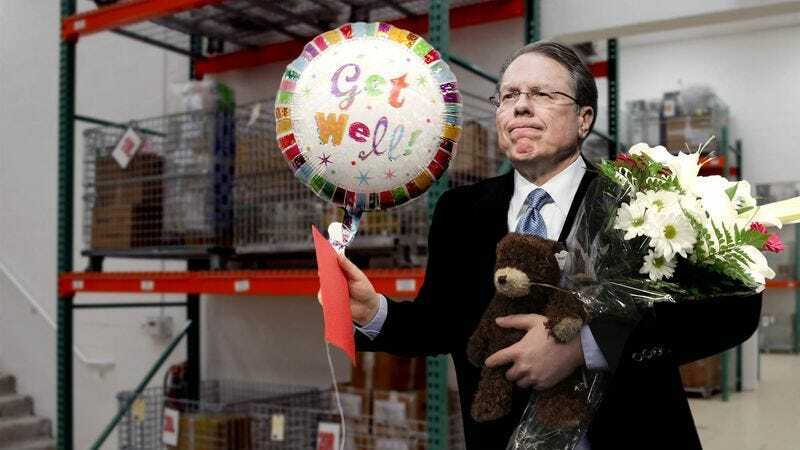 “It’s a little shaken up, but it should be okay—thank God,” said NRA executive vice president Wayne LaPierre, who appeared visibly distressed while kneeling down next to the assault-style rifle and gently placing his hand on the stock. “I’ve just been worried sick since I heard about the incident. It looks like it was dropped pretty hard, and it’s barely got any bullets left, but at least it’s resting safely now. I might just sleep here tonight to keep an eye on it.” LaPierre told reporters that he would do everything he could to help the rifle return home and get back working again soon.